If you have huckleberries in your freezer, lucky you! 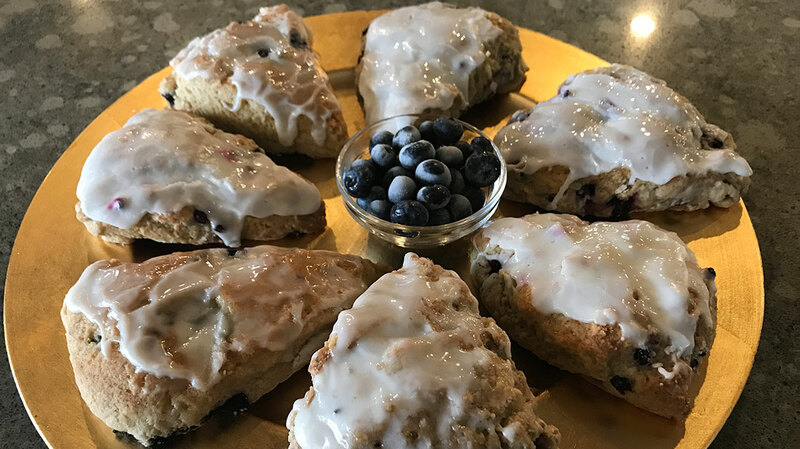 But these wonderful scones are great with blueberries also, just try them! Blend together in small bowl: egg, vanilla and almond extract, and baking soda. Let mixture sit. In another bowl whisk together: regular flour, baking powder, cream of tartar, salt and cinnamon. In electric mixer bowl cream until light and fluffy (3 to 5 minutes): soft butter and sugar. Add flour to mixture all at once, beat at medium speed just until small lumps appear. The mixture should appear crumbly. Gently fold in the sour cream mixture until moistened throughout, then fold in berries by hand. Flour your hands, then lift out mounds of dough, scraping bowl until emptied, and divide mound in half, creating two 8” rounds about 2 inches high. If desired, sprinkle coarse sugar crystals over tops before cutting. Cut each round into 8 wedges. Place 2 inches apart on pans lined with either parchment paper or silpat liners. Bake for 15 minutes on the middle shelf of oven. Rotate pan if needed, then bake 5 to 10 minutes more, until scones are lightly browned. When scones are cooled, drizzle either simple powdered sugar glaze or white almond bark glaze. White Almond Bark Glaze: Melt white almond bark in microwave in a quart size freezer zip lock bag. Cut tiny hole in corner of bag and drizzle scones.